Our Winter Sale is happening NOW through Sunday January 1. ALL FABRIC 20% TO 50% OFF! We are open 10-6 today and 10-2 tomorrow for your holiday shopping needs! It might be too late to start a big new project, but there are still plenty of things you can pick up in a flash! Hand turned seam rippers, made exclusively for Treadle Yard Goods! And if all else fails, there are always GIFT CERTIFICATES! Happy Holidays and Winter SALE! The holidays are here! As I scramble to get the shopping, wrapping and cooking done, I am reminded to stop for a moment and breathe. To be thankful for my family, my amazing staff affectionately known as the "Treadlettes," and our wonderful customers, many of whom I call friends. You have made the last year a delight! 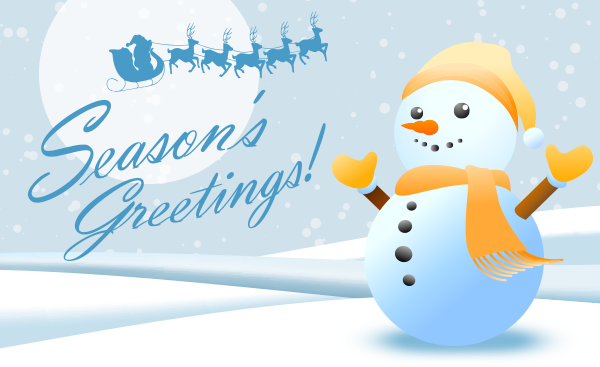 May your holiday season be filled with blessings large and small! 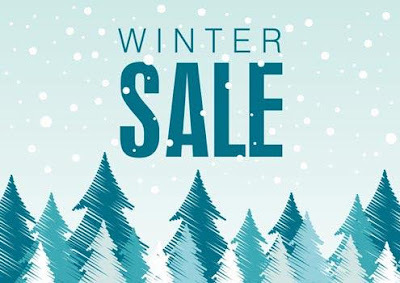 Our Winter Sale begins Monday, December 26 thru Sunday January 1. ALL FABRIC 20% TO 50% OFF! Hi everyone, Elizabeth here! For today's Treadlette Tuesday, I wanted to share I project I recently made for my 7-year-old daughter. Dressy clothes for kids are fun, but I don't like spending a ton of time (or cash!) on something that will only be worn a few times. This skirt was super quick and economical. I used a half yard of our lovely new polyester taffeta to make this skirt. It was a bargain! My daughter chose the lace and buttons from my trim hoard. Altogether it took me 30 minutes and under $10 to make. I didn't use a pattern; I just seamed the selvage edges together, folded the top for an elastic casing, and blind hemmed the bottom. If you would like to make this skirt from a pattern, New Look 6409 is very similar. There's still time to make dressy holiday clothes! You can whip up something quick, too! We have an adorable new doll project panel! "Just Another Walk In The Woods" is inspired by the story of Hansel and Gretel. Take a look at these sweet soft friends! The panel includes two dolls, a bear, and a bunny, plus a quilt and pillow for them all to sleep softly under. There are complete directions for sewing everything, so making this project is a breeze! 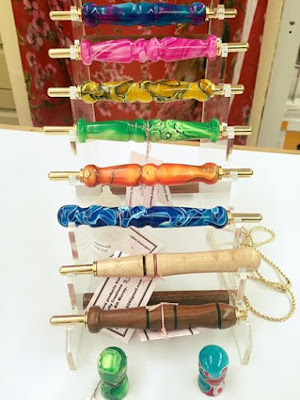 Perfect for a quick-to-make gift! Plus, we also have these coordinating prints! They would make a great quilt or an adorable "dress like your dolly" outfit. Last week, Treadlette Julia made these adorable, matching dresses for a girl and her dolly! Julia made the dresses for her local Christmas Adopt a Family program. One of the family members is a 7 year old girl who loves pink and purple. Julia saw this printed corduroy and knew it would be perfect! Plus, what girl wouldn't love to dress like her doll? The pattern is Kwik Sew 221, a simple, sleeveless pullover dress. Julia made a few modifications, including replacing the velcro in the doll dress with a zipper. I think it looks great! First up, wide stretch laces. Pair stretch lace with knit fabrics - or even use for lingerie! These non-stretch laces pair best with woven fabrics. From narrow cotton edgings to wide embroidered net, there are lots of laces for you to choose from! Give your project the perfect finishing touch! It's flannel pajama season! Whether you need to make quick and easy gifts for your loved ones, or just want to curl up and get cozy, you'll be happy and warm as toast in a fresh new pair of flannel PJs! These adorably stylish new prints are just the thing. You're not limited to just jammies, though! These flannels would also be perfect for comfy soft quilts or whimsical shirts for kids or adults. This week on Treadlette Tuesday, we're sharing this gorgeous hoodie made by Treadlette Rebecca. Don't be fooled by the intricate embroidery - Rebecca actually used a clever and time saving applique technique using an embroidered net fabric! She cut around the embroidered motifs and machine-appliqued them to the wool, then trimmed away any excess netting. The result is stunning - and faster than doing all that embroidery yourself! Stay tuned for more Treadlette Tuesday, every week! We'll be bringing you pattern reviews, projects to share, favorite fabrics, and so much more. Do you wish your sewing was more organized? Are you looking for a great sewing gift? Look no further - the Colette Sewing Planner is here! Helpfully arranged by season, you'll find style and measurement charts, project pages, and lots of places to design, sketch, and make notes! The planner also includes 4 different croquis outlines for various body types. Trace the one that most resembles your figure to create ideas and try out styles. Organize your sewing! The Sewing Planner can help! It's the perfect time for a new winter coat or jacket! We have a huge selection of scrumptious coat-weight wools this season, in a rainbow of colors! From thick, soft Melton to fleecy boiled wools and textured tweeds, find a perfect new garment here! Let's face it, winter is going to be here for a while. Let's get comfortable. Check out these fantastic new Liberty of London prints! Liberty's smooth cotton lawn and breathtaking prints are truly one of a kind. Melissa is our resident Home Decorating Expert. She's always got a clever solution for sewing curtains, Roman shades, quilts, and pillows, and well as recovering chair seats and cushions. If you've been in recently and seen (okay, played with) the sequined pillow on our counter, you've seen a little piece of Melissa's work. She tackled that tricky fabric fearlessly! She's no slouch when it comes to garment sewing, though. Melissa can whip up cute blouses and dresses and has a knack for choosing fun and funky patterns. Melissa also teaches classes with us! She can help you solve your decorating dilemmas in a Sewing Salon, or take her pillow class or Roman shade class to spruce up your space! If you know us at Treadle, you know we love natural fibers. But sometimes a really great fabric comes along that makes us keep our minds open. This polyester taffeta is one of them! Airy light and paper crisp, this taffeta has a wonderful sheen and fabulous rustle. This is the nicest polyester taffeta we've seen. It is almost like silk! Taffeta is fantastic for special occasion dresses and skirts. Make yourself something new for holiday parties! Fancy wraps and jackets would also be lovely. Take advantage of taffeta's crisp hand with ruffles and structural details! Our sale continues today! Stop in for great savings! Shop our weekend sale! 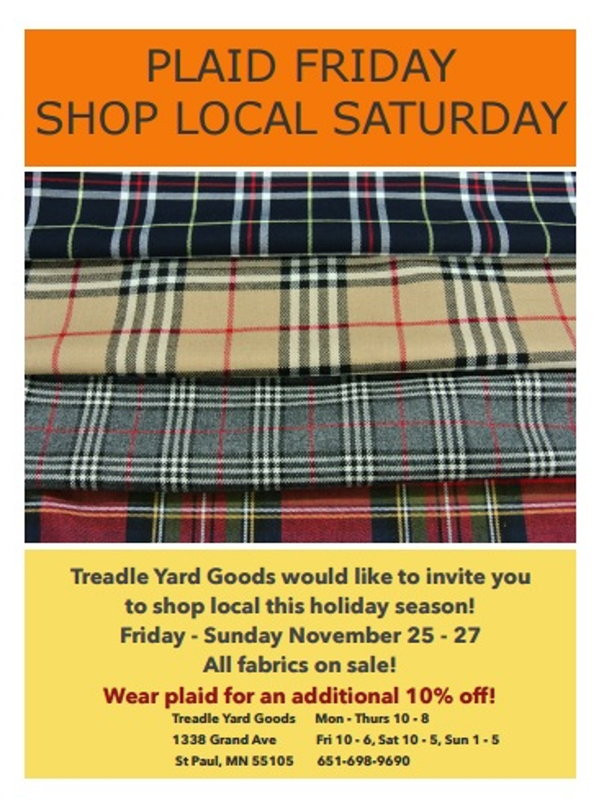 Plaid Friday and Shop Local Saturday events support local businesses in your area! EVERY fabric in the store is on sale! 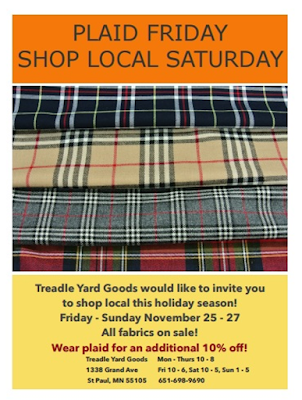 Wear plaid for an even better discount! Friday through Sunday, Nov 25-27. Boyfriend Shirt Class - Starts This Sunday! We have our new Boyfriend Shirt class coming next week, with our newest teacher Kathleen Richert! Kathleen is a prominent local fiber artist. She even has a piece in the Minnesota History Center! See it here! Make something special for your favorite guy (boyfriend, husband, son, brother - you pick) in this fun new class! Take your shirt making skills to the next level and explore the fun you can have with piping, custom pockets, and other delicious details. Kathleen makes award winning custom shirts with one rule: she makes all the design decisions. Be prepared to dump your ideas of boring button down shirts; these are one of a kind and amazing! To sign up for this class, give us a call at (651) 698-9690, or just stop by the store. 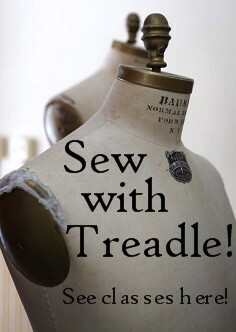 You can see our full class schedule at treadleyardgoods.com/classes. This week's Treadlette is Meg! Meg started sewing with her grandmother at around age 8. "We made a grey and red plaid vest with princess seams and matched the plaids! I wish I still had it to prove it." Like many of our Treadlettes, Meg has been with us a while; she has worked at Treadle for at least 27 years. You will mostly see her on Saturdays. I find Meg's style to be polished and effortlessly stylish. "I am a sucker for white embroidered cotton, beautiful knits and the challenge of buying remnants. I like to sew simple straightforward things that do not take a long time from start to finish--clothing and home dec."
Current projects and favorites? "I love Vogue pattern 1415 view A with a cowl like neck--I've made it twice and feel very elegant in it. My 26 year old son actually asked me when he saw my 2nd version if it was the same pattern as my cream colored top. I love that he noticed! Currently I am covering an ottoman for my son with a piece of Pendleton wool." "I am working on convincing myself that if I sew a few minutes every day, it will add up to a significant amount of work at the end of the week." I think it does, Meg! I love that philosophy. There's more Treadlette Tuesday every week!